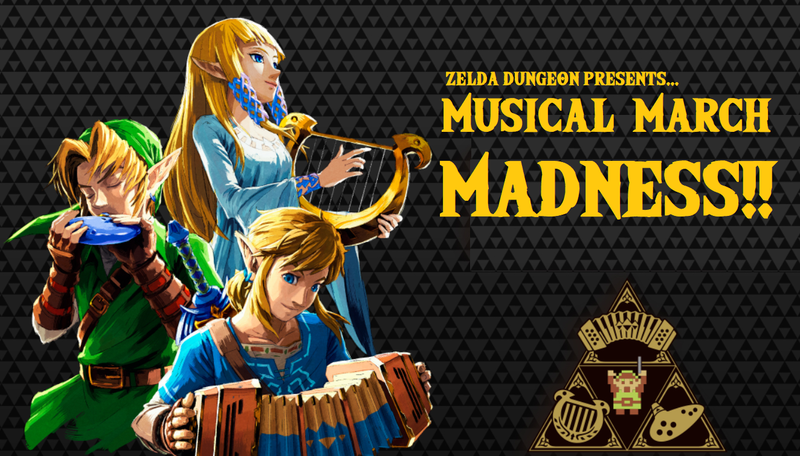 Zelda Dungeon’s Musical March MADNESS Tournament Begins March 1st to Decide the Best Zelda Song Ever! Bracket Inside! The month of March is almost upon us, and not only does that mean the winter is almost over, but it’s time for March Madness! Of course, we just couldn’t sit by and not get in on the action, so we decided to put a spin on a yearly feature that we like to run on the site. In 2018, Zelda Dungeon polled all of it’s contributors, from editors to social media managers to forum members to wiki editors, to collectively come up with our Top 50 Song’s from The Legend of Zelda franchise. With staff coming and going, tastes evolving, and new tracks being released however, a lot can change in a year, and thus, we were ready to do the polling all over again… that is, until somebody realized that 50 and 64 weren’t that far off, and that instead of hogging all of the action for ourselves, we’d let our readers get in on the fun. And so Musical March Madness was born. 64 songs from The Legend of Zelda series will compete in a NCAA-style single elimination bracket with the winner moving on to the next round until there is only one remaining. One to take home the title of Best Zelda Song Ever. Featuring songs from every single mainline Zelda game, as well as Super Smash Bros., Hyrule Warriors, and even Wand of Gamelon and Tingle’s Rosy Rupeeland, the field is truly wide open for any track to take the title! The brackets and seeds were set up after combining the results of last years list with the answers we received from our current staff asking for their favorite tunes. Before getting into the bracket, I want to explain how voting works. YOU WILL HAVE ONE DAY TO VOTE. Every day for the month of March, there will be new match ups. Polls will last for 24 HOURS, SO BE SURE TO CHECK DAILY. There will be one post pinned to the top of the site that will be updated DAILY. BOOKMARK IT TO MAKE SURE YOU DO NOT MISS ANY POLLS! The first 12 days of Musical March Madness will have 4 matches each. Day 13-16 will have 2 matches each. Day 17-23, aka the Elite Eight and onward, will feature 1 match per day. There will be a 1 day break in between each round to prepare for the incoming round. … with the winners of each Division doing battle in the Final Four to determine the winner! A simpler, text version of the bracket can be found here. And there it is! Join me and the rest of the team for all of the, well, madness sure to come from this tournament! Remember, keep it friendly and respectful! Let us know in the comments below how you think the tournament is gonna go down!